The Punjab and Haryana High Court has made it clear that the rule-making authority can fix the age for recruitment provided it does not violate provisions of the Constitution. A clash between the sarpanch of Ghogripur, his family members and villagers that had turned violent with the sarpanch’s son opening fire, recoiled today as the mahapanchayat convened by the villagers called for his boycott and vowed to ensure his defeat in the Assembly elections. Angry demonstrations and blockage of vehicular traffic were witnessed at more than half a dozen places in Sirsa and Fatehabad today against an unprecedented scarcity of power and drinking water in the area. A major fire was averted at a petrol station near the Panipat refinery here today. The incident took place when one of the oil tankers stationed at the Jagdamba petrol station caught fire. The tanker, which was reduced to ashes, caught fire when the employees of the station were emptying the tanker. Sore over the alleged apathy of the government regarding the demand to withdraw the hike in fees effected by private schools, parents of students today staged a dharna outside the residence of Congress MLA from Ballabgarh and Parliamentary Secretary Sharda Rathore. Maharshi Dayanand University (MDU) today declared the results of the BA/ BSc/ BCom (part III) annual examinations, 2009. The examination for admission to the auxiliary nurse, midwife and general nurse midwife courses, scheduled for June 22, has been postponed. The new date of the examination will be announced soon. The police has booked Rekha Saini’s husband Satish Kumar, father-in-law Gajraj Saini, mother-in-law Santosh Devi and brother-in-law Sohan Pal Saini, all residents of Jetpur village, 15 km from here, for Rekha’s death. A person was allegedly killed by his neighbours in Dhrana village here yesterday. A dispute over water drainage between the two families is stated to be behind the incident. The deceased has been identified as Sukhbir Singh. The police has registered a murder case against four persons of a family, including two women, in this regard. With this, the high court has upheld Haryana’s action of fixing 21 years as the minimum age for selection as an inspector. The Division Bench gave the ruling on a petition filed against the state of Haryana and other respondents by Sachin, a candidate for police recruitment. He had challenged the action of the Haryana Staff Selection Commission, declaring him ineligible for inspector’s post in the Haryana Police Department, as he was “not fulfilling the age requirement” specified in the Punjab Police Rules applicable to Haryana. “There are numerous factors which enter at the time of determining the age for recruitment to service. In the present case, the hierarchy of the police will show that at the first level constable is recruited. He may, by the process of promotion, become head constable,” it added. “Thereafter, if his service record shows satisfactory performance and he passes the prescribed examination, a head constable could be promoted as an assistant sub inspector and then as sub inspector. In the hierarchy, four channels of promotion have to be achieved before a constable could be appointed as an inspector. In the present case, the age of 21 years as on February 1, 2008, has been fixed by the rule, which cannot be considered to be unfair or arbitrary because an incumbent of the post of inspector would require a particular level of maturity and experience,” the Bench added. Blaming the local MLA, Tejinder Singh Mann, for the clash, the mahapanchayat, presided over by Pratap Singh Mann, resolved that the villagers would have no political association with the MLA. The mahapanchayat urged the Congress not to give the party ticket to the sitting MLA and burnt his effigy to express their anger. Exposing the MLA’s alleged acts of omission and commission, speakers at the mahapanchayat alleged that he was in league with the sarpanch, who was emboldened due to his “covert support”. The mahapanchayat gave an ultimatum to the government to arrest the remaining four alleged accused involved in the clash, failing which the villagers would go on fast unto death, spokesman for the mahapanchayat Shobha Singh said. Meanwhile, the MLA said the mahapanchayat was “invalid” as representatives of required number of villages were not present and the charges levelled against him were “totally baseless”. He claimed that he had never visited the village except for development works and the allegations that the sarpanch enjoyed his support were preposterous. He said some anti-social elements were trying to malign his image ahead of the Assembly elections. The sarpanch, her husband and two others were yesterday arrested by the Karnal police and were produced in the local court, which remanded them in 14-day judicial custody. The police had booked nine accused in connection with the clash. However, four persons were still at large. 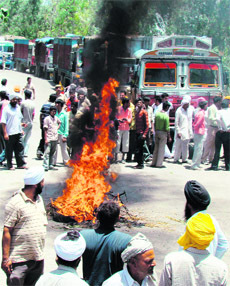 Traffic was blocked near Jakhal town in Fatehabad against frequent power cuts and scarcity of drinking water. Hundreds of men and women blocked vehicular traffic on the Kulan-Jakhal road near Talwara village in Fatehabad for over three hours. Villagers from Bharpoor and Rattakhera held a demonstration in front of the DHBVN office at Ratia. Irate villagers today laid a siege to the 132 kV substation in Mithi Suera village in Sirsa and blocked traffic against scarcity of power. Villagers from Ottu, Dhanur and Aboobgarh blocked vehicular traffic outside the substation at Rania in Sirsa alleging acute shortage of power. KAITHAL: Residents of Balwanti village in this district blocked traffic for two hours on the NH-65 near Keorak village on the Chandigarh-Hisar highway, 10 km from here, on Saturday in protest against power shortage. DSP Hari Kailash Sharma and Executive Magistrate Rajbir Dhiman reached the spot and assured the protesters of proper power supply. Karnal: Hundreds of farmers from Ramba and seven adjoining villages on Saturday blocked the Karnal- Yamunanagar road for nearly four hours in protest against power shortage and frequent power cuts during the paddy transplantation season. The farmers, belonging to Sangoha, Sangohi, Darad, Kurali, Ramba, Salaru, Churni and Kamalpur villages, assembled near the Ramba police station, 10 km from here, and blocked the highway from 10 am to 2 pm, bringing traffic to a halt. The police tried to persuade the villagers to lift the blockade but they remained adamant and relented only after AK Raheja, Executive Engineer, Haryana Vidyut Prasaran Nigam, reached the spot and assured regular power supply during the paddy season. A major fire was averted at a petrol station near the Panipat refinery here today. The incident took place when one of the oil tankers stationed at the Jagdamba petrol station caught fire. The tanker, which was reduced to ashes, caught fire when the employees of the station were emptying the tanker. The employees immediately fled the spot and informed the fire brigade and the local police along with the officials of the refinery. A fleet of fire tenders soon reached the spot and the fire fighters took more than an hour to douse the flames. Property worth Rs 8 lakh was reportedly destroyed in the incident. Officials of the fire brigade said the cause of fire was yet to be established. Meanwhile, officials of the IOC have also started a parallel investigation into the incident. The officials said as the refinery was located in the vicinity of the petrol station, it could have led to a major incident. The parents, who are agitating under the banner of the Haryana Abhibhavak Ekta Manch, against the unilateral decision of the school managements to increase the fees in the current academic session, raised slogans against the government outside the residence of the Congress leader. They alleged that it appeared that the government machinery was in “collusion” with the school managements. General secretary of the Manch Kailash Sharma said it had been decided to stage dharnas and hold demonstrations outside the residences of all MLAs from Faridabad as well as the Member of Parliament from Faridabad in protest against their “silence” on the issue. Girls again emerged toppers in the examinations after winning the top three positions in the BA/ BSc/ BCom (parts I & II) examinations. The CoE of the university, KC Dadhwal, said Ankit of Hindu Girls College, Sonepat, topped the BA (III) examination, Sumita Dahiya of Hindu Girls College, Sonepat, scored the highest marks in BSc (III) while Neha of GVM Girls College, Sonepat, topped the BCom (III) examination. Giving this information here today, Haryana Nurses Registration Council Registrar Sumitra Devi Malik said the examination for these courses was to be held at the MM School of Nursing, Mullana; the General Hospital, Ambala; Hisar, Sirsa, Bhiwani and Nursing School, Agroha. A case under Sections 498-A and 304-B of the IPC has been registered against them on a complaint filed by Rahul Saini, brother of the deceased. Rekha (20), who got married to Satish 18 months ago, delivered a male child on June 18. However, the child died after a few hours. Subsequently, Rekha’s condition too worsened and she died. The complainant alleged that Rekha was subjected to cruelty for dowry by her in-laws and was also denied proper treatment during pregnancy, which eventually led to her demise as well as her child. The body was handed over to the family after a postmortem was conducted here yesterday. The incident took place when Sukhbir was working in his fields. Naurang along with three other members of his family reached there and allegedly assaulted Sukhbir with agricultural implements. Thereafter, all assailants fled the spot leaving behind the badly injured, Sukhbir. Family members of Sukhbir took him to the local Civil Hospital, where he succumbed to his injuries. Later, a case was registered against Naurang, his wife Guddi, brother Dharamveer and his wife Suresh on the complaint of the family members of the deceased.